The third episode of this series opens at Cowley General Hospital, to all appearances a modern, respected establishment, and specifically Fosdick ward, overseen by the venerated Sir Merlin (David Yelland), the philandering Dr. Powell (John Hopkins), and a team of dedicated nurses under Sister MacMahon (Amy Marston). It quickly becomes apparent that all is not well on the ward, as a number of patients have died unexpectedly, all of them in bed 10. 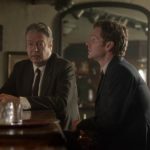 The situation comes to the attention of Cowley police station when an informant who works with Thursday (Roger Allam) named Terence Bakewell (Alex McSweeney) takes ill and is brought to the hospital. Wary of an attempt by the Matthews gang (last seen in Coda) to silence the Crown’s witness, Thursday assigns Morse to stand guard over the prisoner. 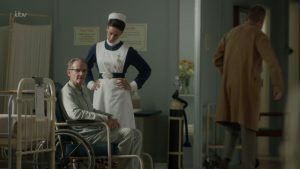 Meanwhile, Morse investigates both the death of Mrs. Zacharides (Claire Lichie) who had earned a reputation at the hospital as a nuisance in the pursuit of regaining possessions of her late husband, who fell foul of the infamous bed and the whereabouts of Joan Thursday (Sarah Vickers). Having received a reverse charges call from Leamington Spa, he tracks down Joan in a block of flats, living well enough to afford a fish tank. Morse is gently incredulous that she would (apparently callously) inflict such pain on her parents, but cannot convince her to return to Oxford or even contact them. 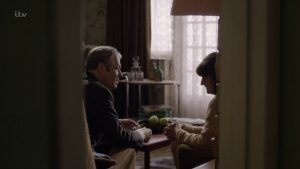 While she acknowledges that there may have been something once between her and Morse (and, Morse tries to convince her, can still be), it’s clear that her trauma has led her to a place she is not comfortable leaving. 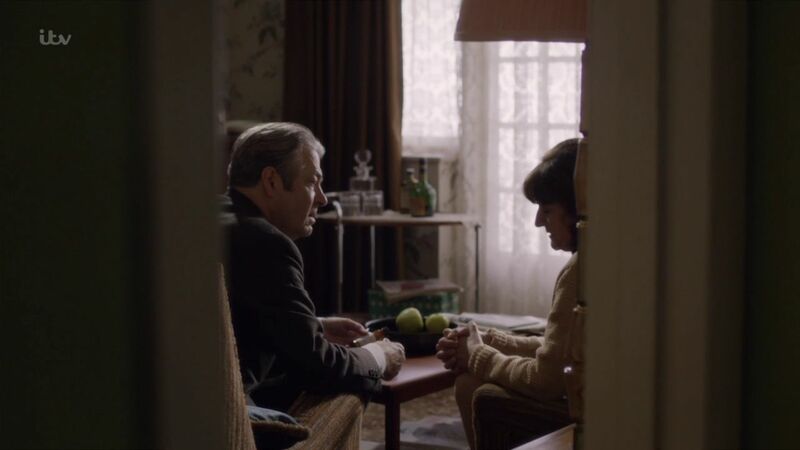 Disappointed, Morse departs, but not before noticing Joan’s visitor: a man with the key to her flat who takes off his wedding ring before entering. In Oxford, Morse is confronted by the spectre of past relationships twice more, in the form of Nurse Monica Hicks (Shvorne Marks) and the mother of Susan, the girl he’d been engaged to at Oxford (Caroline Bryce-Morgan, played by Phoebe Nicholls). Monica has moved on, though only a tiny glimmer of information is given about the end of their relationship. “Treat the next one better,” she tells him. Mrs. Bryce-Morgan is not so kind. Her husband, Edgar, has had a stroke, and while Morse is genuinely concerned and sympathetic, she clearly has no time for him, lashing out at him with pointed comments about his employment, especially relative to Susan’s new husband. Meanwhile, back at the nick, Thursday is busy as the acting head of the station when Superintendent Bright (Anton Lesser) is felled by a perforated peptic ulcer and rushed into surgery. “Flying a desk,” as Thursday puts it, doesn’t suit him at all, but he handles it with the same dogged determination as always, aided by a frequent glass of scotch. The deaths on Fosdick ward continue, with Bakewell making the ninth victim, which leaves DCS Bright to move into the fatal bed. It eventually emerges that the murders are all the work of Staff Nurse Jo-Beth Mills (Sarah Winter), whose sister died as a child in the care of Dr. Powell and Sister MacMahon, who were engaged in a carnal embrace when on duty, leaving the ward unattended. While the mystery is a relatively straightforward one, by Morse standards, it takes a backseat to the personal stories of Morse and the Thursdays. After ten weeks, there’s still no sign of Joan. Win Thursday (Caroline O’Neill) has let her attempts at keeping busy fall by the wayside, plagued by anxiety and guilt. She’s unseen the first time Morse comes to pick Thursday up at the house, and hasn’t made her husband’ sandwiches. Later, she appears, but is quiet and fretful. “Did we do something wrong?” she asks Morse, and while he is quick to reassure her, it seems nothing will ease the pain. It comes as very little surprise when Thursday comes home to find her in a daze on the sofa, record player long gone to static. The pain of Joan’s departure has grown too much for her, and she’s seen the doctor for some relief in the form of medication. Thursday’s initial shock gives way to deep, genuine concern. “I’d do anything for you, you know that,” he tells her, and it’s true of every facet of his life. He doesn’t know how to give any less than his all to the things he cares about: his family and Cowley station. But the effort takes it toll, as Thursday grows visibly (though subtly) more tired as the episode goes on. This culminates in the penultimate scene, where Morse and Thursday are in the pub together, though neither is eating. (Thursday, it emerges, is making his own sandwiches, and cannot even remember what he’s put in them). Morse holds his silence, and the audience is left with Thursday’s resigned acceptance of things he cannot change. 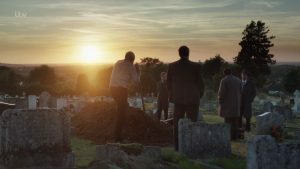 In the last scene, viewers watch Morse struggle with his own regrets as he attends the Bryce-Morgan funeral from afar. He has one last glimpse of Susan, and turns away, consigning their relationship to the past. The central theme of the episode is the loss of people held dear: sisters, daughters, true loves. Every performance is nuanced and layered, and while every thread has its own consequence (madness in Nurse Mills, depression in Win Thursday), they are all embodied with the pathos of shared humanity. 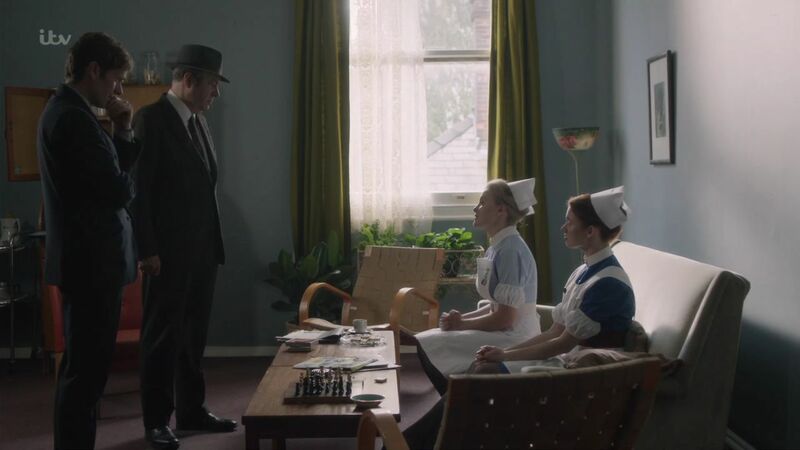 In particular, Allam’s acting is top-notch, his performance of a DI Thursday slowly being ground down under the weight of his need to be all things to all people (he is DCS Bright only visitor, and goes so far as to promise to protect Bakewell’s daughter). The viewer is reminded of Win’s assurances in Coda: “Fred will sort it. He always does.” While it’s clear Thursday will do everything in his not inconsiderable power to take care of those he feels a duty towards, there is the painful realization (however slow in coming) that there is little even he can do against the course of human nature. How he will manage this against the backdrop of his ever-increasing responsibility remains to be seen. A great series. Greatly underated for its atomospheric scenes and acting by the cast. Just as it was in the days before central heating, mobile phones, iPhones, PC atittudes to life, diesel cars, women’s lib, fox hunting bans, and modern strictly dancing. I didn’t say the above was good but what we were brought up on. Bread and dripping, postubs, washing days, baking days, snow, frost and lots of sugar. Caroline BM’s scathing words mislead me to believe Endeavour must have ended the relationship with Susan, and had hurt her. That would explain a mother so viciously demeaning him. If actually she despised him already before the breakup, say from the very beginning when her daughter brought him to their estate on the so-many visits she alluded to, wouldn’t he have gotten any whiff of it? And so then why would he fairly cheerily approach her at the hospital and not recoil and duck behind a potted plant or corner? That was confusing. Can someone tell me about Caroline Bryce-Morgan’s Edgar? HIs name is so close to that of the police big shot that I was all mixed up. Do we KNOW him or is he just the father of Susan? I too am confused why Mrs. Bryce Morgan is so vicious with her comments to Endeavor. What episode did this hate start between the two?